Commercial-grade LCD displays and industrial PCs are designed for the tightly-controlled environments found mainly in office settings, and they work quite well in such situations, but most industrial and military computing environments experience adverse conditions due to elevated levels of shock, vibration, heat and moisture, not to mention external sources of electronic noise. These applications require systems that have been engineered from the ground up to maintain peak performance and reliability under such harsh indoor or outdoor conditions. The key to building any rugged electronic device begins with an understanding of how mechanical enclosure of a specific industrial PC computer or rugged LCD display interacts with internal electronics once the unit is fully integrated and operating in a variety of demanding environments. Contributing to the rugged nature of Dynamic Displays’ LCD solutions is the fact that we design our electronics with rugged 2-layer Printed Circuit Boards using long-life components. Dynamic Displays employs a systems engineering approach to the design, manufacturing and integration process to create customer-driven solutions that can withstand the punishment of deployment in adverse environments. 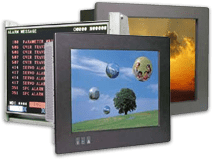 Our proven design methodology allows customers to choose from a wide variety of signal input options, touchscreen options, bonded anti-reflective or vandal-proof panel options, and power supply options which can be installed in a number of rugged open-frame, rack-mount, NEMA-grade panel-mount or stand-alone weather-proof enclosures that have been designed with shock, vibration & thermal issues in mind from the beginning, not as an afterthought. Contributing to the rugged nature of Dynamic Displays’ LCD solutions is the fact that we assemble and test each unit in the United States to our high quality standards with strict revision control.